Designation: CEO and co-founder, Embrace Innovations. It sells low-cost infant warmers for low-birth-weight and premature babies in developing nations. 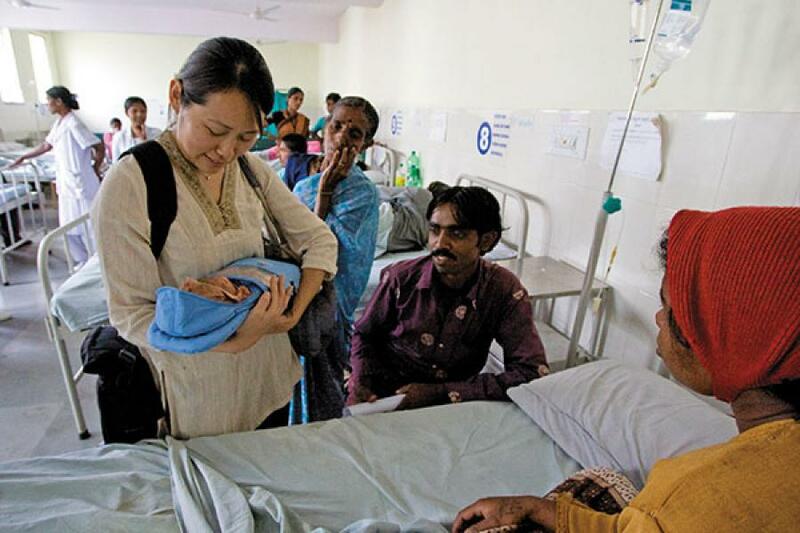 It has partnered with multinationals like GE Healthcare to address infant mortality. I came to India twice before moving here in 2009 to start the India office for Embrace. My first impressions were very chaotic. What struck me most was the disparity. Many of my Stanford classmates in Mumbai and Delhi were from very affluent backgrounds. Visiting them and then going back to the slums right outside the city, where infant mortality was so high, was quite shocking for me. It felt that a lot of people had become numb to the situation and were turning a blind eye. I also saw a lot of hope. I met a number of amazing doctors who were doing incredible work. I moved to Hong Kong right after college and was working as a management consultant in an American firm. One day I read an article in The New York Times about how millions of poor farmers in China had contracted HIV through selling blood. Under this government-run scheme, hospitals would pool all the blood, separate the plasma, and re-inject the remaining RBCs into each person thinking it would allow them to give blood quickly. When I read the piece, something happened to me. I quit my job and joined an NGO, which was helping children orphaned due to HIV. It was a remarkable experience. I learnt that a small group of dedicated, passionate people taking small steps could affect social change. I also saw this huge health care disparity. In the US, anyone who needed AIDS drugs could get it. In China and later in Africa, I saw many people dying because they couldn’t access these medications. For me, Embrace is not about a product; it is about building a platform by which we can reduce this disparity. It’s been very challenging; there is no established infrastructure or distributors or even medical protocols in India for the kind of work we want to do. It forces you to be very entrepreneurial. I really like the term jugaad; it characterises India so well and what you have to do to survive. When we first landed here, we had no idea about how to get our clinical studies done. We didn’t have any contacts, so we took the yellow pages and went door-to-door, doctor-to-doctor in Mumbai and Delhi. That is how we ended up meeting some really good doctors in Bangalore who are now a part of our advisory panel. In India, it was so difficult to set up an office or even a bank account; in Hong Kong I could do that in a day. And yet, we have been able to do a lot here. Once we were able to find the believers, they went really far to support us. NRN Murthy [Narayana Murthy of Infosys] is a supporter of our nonprofit. He is one of the most amazing people I have met in my life. He was very busy but was willing to make personal connections for us. He put his name behind Embrace. A lot of India is, unfortunately, who you know. My big learning last year was, just because there is a need, as demonstrated by the numbers, it doesn’t mean there is a demand for your product. When we started to sink our teeth in the private sector, a lot of people said doctors are only motivated by money. It’s true of any country. But in order to do this kind of work, you have to be very deliberate about the lens through which you see the world. There will always be doctors who truly want to help their patients. And if you look for them, you will find them. As opposed to if you just come here with the notion that everyone is all about economics. You have to be deliberate about the point of view you want to take. The government is the most centralised procurement agency if you want to reach the poorest population but it is a big, hairy beast. When we went to Kerala we didn’t know anyone. We just landed in the office of the health secretary. We appealed to an official, saying we are students trying to do some good and the guy just took pity on us and said, “let’s try five units”. We got incredible feedback on it. We got into one of the biggest tertiary hospitals in Thiruvananthapuram. We used that to come to the Karnataka government, the Rajasthan government and each of those led to a bigger success. We just sit there, in the government offices. Sometimes there is an introduction, sometimes there isn’t. Often, there would be 10 other people waiting even as we are talking, chiming in with their own inputs. Many a time, government officials wouldn’t even look up and the woman signing papers would just say, “Tell me”. They would accuse me of being a foreigner and say, “What do you know about Indian health care?” And you just take it. You just move on till you find someone who believes in you. That is entrepreneurship. When I am travelling through India, most people think I am from Assam. Once a woman stopped me at the airport and asked, “Are you from Assam?” I said, “No.” And she said, “Are you sure?” I said, “What kind of a question is that?” Usually I can blend in; I only wear kurtas and Indian clothes when I am here. That’s not difficult. In the early days you have energy, you are willing to do whatever it takes. But after some time it wears you out. When I feel that way, I go out and talk to our customers, the mothers especially, and I remember why I did this. We met this woman who had lost her first baby and used our product for her second baby who was born prematurely. The baby just turned one. Even if it’s one baby, that’s why we do this. You hear these numbers—8 million premature babies and 1.2 million deaths a year. It’s not until you meet these women that you understand what they have to go through. They have no resources. There are a lot of cultural nuances. For example, the warm pack has a temperature display and we would ask the women to ensure it stays at 37 degrees [the body temperature]. But it turns out these women didn’t trust Western medicine, so they would keep the temperature a little lower. So, we now have a new design that just says ‘OK’ or ‘Not OK’. When we first launched our product, we thought doctors would know how to use it. We assumed that mothers who were illiterate would have to be told how to use it. When we launched the second version of the product we went into the field and did a training assessment. Guess who performed the best? It was the mothers because they cared the most. In a country like India where you have one doctor for 2,000 patients, doctors cannot spend time with every patient. When you look at global health products, none of them are designed for people who care the most. So, that was the big ‘Aha’ moment for me and that is how we want Embrace to think of innovations. It is so perfect product for developing countries and kindly please let us know your contact Adress so we can Adress to our people. David from Ertera. Truly inspiring. The takeaways for me: The design innovation that says OK or NOT OK, instead of indicating the actual temperature, keeping the behaviour of the user in mind. The mothers performing the best in training assessment, because it is they who cared the most. Not all doctors are money-minded. We have to be patient and search for the right people and we will find them. Wishing Ms. Jane all the best in her efforts. Always felt like doing something for a social cause.But never could get into it.Hats off to you! Its very commendable that a few people make such a difference to others.Best of luck. Very inspiring, makes me feel that it is possible and one can add value not being a numb. Wish you all the best. This article makes doing good work sound like an achievable goal. I am so impressed and inspired. Inspiring work. A few things work in India because of these good people. God bless you.